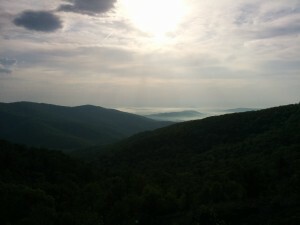 All spring, I had been planning this long run through Shenandoah National Park as a way to celebrate my 30th birthday. I suppose I didn’t have to connect the two, but it seemed like a hell of way to usher in my 4th decade. So I spent the January through April building up my mileage. Unfortunately, after a back-to-back weekend combination of the Blue Ridge Marathon and Promise Land, my shins had, apparently, had enough. I mention this because, if you can swing it, I recommend this series of events before a gigantic and challenging trail adventure. I told people who care about me that I wouldn’t push it if I were in pain (so I knew that the sympathy well would dry up if I came back hobbling on account of my stubbornness), yet I had nothing to lose by giving it an honest effort. As a result, I didn’t have any problem taking my SNP adventure a mile—or sometimes even just a step—at a time, which is probably what kept me from thinking, “Wow, I have a really long way to go.” And, oh man, it definitely was a really long way to go. 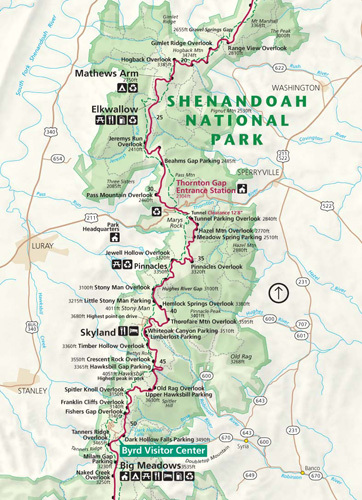 Way back in January, when I was originally scheming about this trip, I picked Sophie Speidel’s brain, and we discussed the idea of making my Tour de Shenandoah a four-day run, as opposed to the three-day one that I’ve heard of many people doing. This ended up being a perfect fit for me. If you’re interested in seeing how I broke down my mileage, check out my Google spreadsheet here. I decided that navigating from north to south entrance stations, on whatever trails it took, was more important to me than sticking to the AT the whole time. I also put a premium on camping, but decided against the backcountry, so the distance between campgrounds defined the length of my days. But what that pretty detailed document doesn’t show, of course, are the wonderful, tiny moments and observations that make adventures like this worth taking—such as the stretch during the first afternoon when I ran through hundreds of baby grasshoppers dancing around in the low growth beside the trail, the time during the last night when I saw the stars appear from behind the storm clouds as they rolled back, or the way the fog pooled like lakes between the ridges every morning. More importantly, though, it does not even hint at the most important part of the whole trip: the tremendous support I got from the people that helped it happen. As some of you may know, my boyfriend, Michael, is an incredibly strong runner. (I was once asked, catching up to him on a run, whether I was with “that animal” up ahead. I gleefully confirmed.) I’ve crewed him frequently, and got a lot of my planning tips from him. 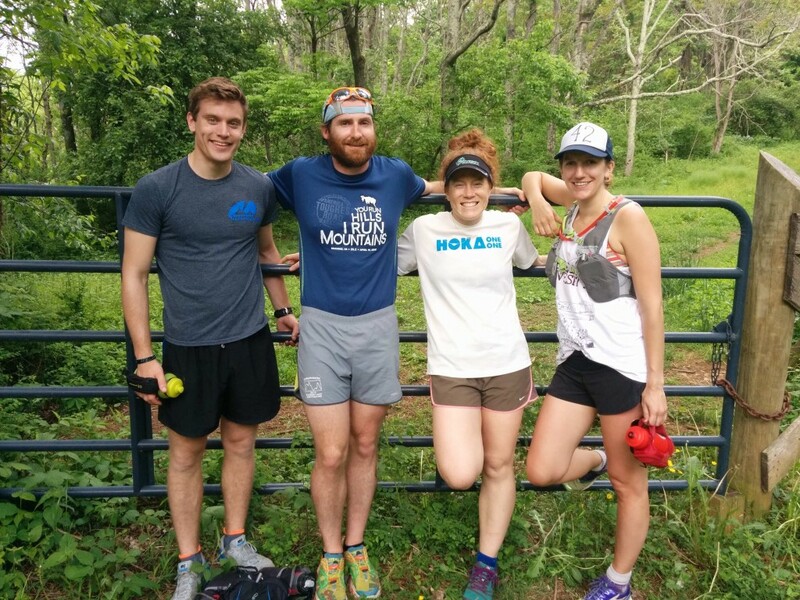 But it turns out, for as good of a runner as he is, he’s an even better crew chief. He saw me through every step of the way. Me (on the right), trying to swallow the enormous amount of food I’ve just crammed in my mouth, as my wonderful friends look on with approval and Michael captures the moment forever. Typical of crew stops. Anna, my soul mate with the same name (and collaborator! 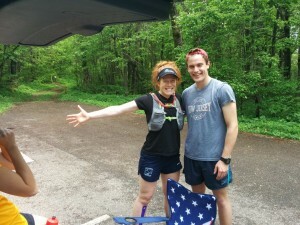 ), arrived Friday night and stayed through the end, and Mindy, another close friend—and most frequent workout buddy—kept us company on Friday and Saturday. 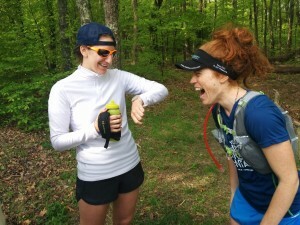 Another typical sight: Extreme laughter. In the face of four days of devotion from a coterie of my favorite people, what was a little speed shuffling, on my part? Sure, it occasionally felt like, you know, the most difficult thing I’d ever physically done, but I never lost the general sensation of feeling lucky: lucky that I had a job flexible enough to support a long weekend away from my desk, and enthusiastic coworkers who were excited to hear how things went; lucky that I could spend four days in the mountains; lucky that I could put one foot in front of the other without shin splints, or anything else, holding me back; lucky that I had such an incredible crew to have my back. Almost done, my brother looking like some sort of ad for vitality and vigor. He’s 20, so that may have something to do with it. Also, please note that I am actually wearing the shirt off Michael’s (2nd from left) back in this picture. 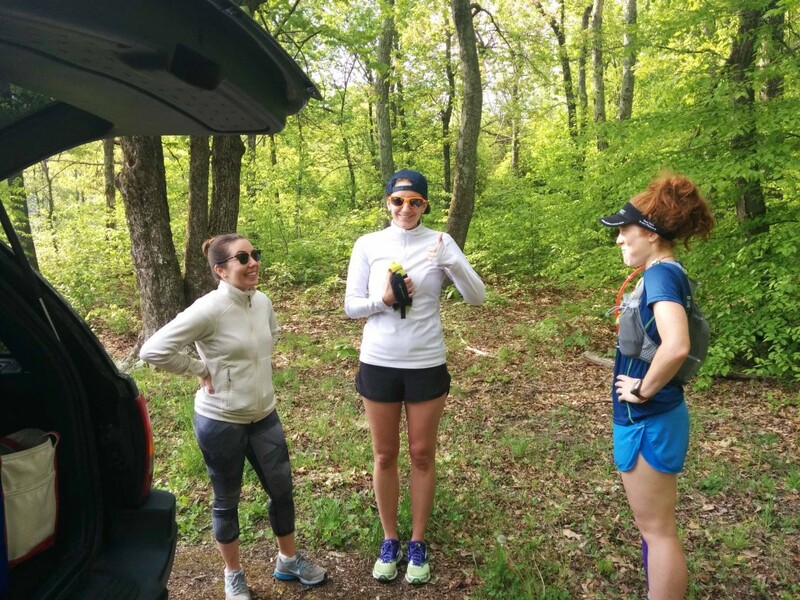 I’d describe the feeling I had running into Rockfish Gap, with Anna, my brother, and Michael flanking me, and my parents waiting and cheering, as elation. But not just because I’d finally finished the 113.7-mile trip I’d started 4 days earlier—because I did it with the help of people I love. I’m looking forward to plenty more adventures, including ones where I’m on the support squad, applying sunscreen, prescribing pickle juice, or just keeping my people company along the way. Great read Annie! Nice job on the SNP tour. Makes me giddy to get out there right now!